You mentioned your all-time favorite sock yarn, but I didn't catch it in time. I love to knit socks, but am so discouraged by how poorly the yarns wear. Can you mention your favorite sock yarn again please? I'm so glad that GiGi is better and back to the podcast - even though I did enjoy hearing Laura. 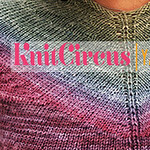 I was a week behind but am now caught up...and have ordered my first skein of Regia!